BIMOLCHAND SINGH, Leishangthem. 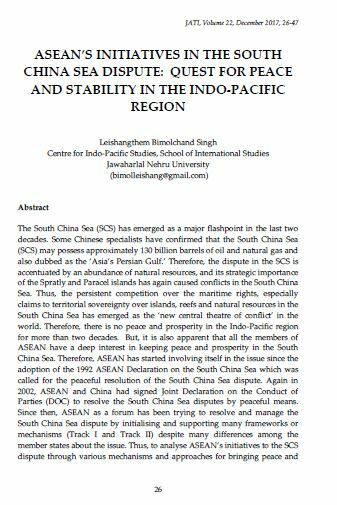 ASEAN’S INITIATIVES IN THE SOUTH CHINA SEA DISPUTE: QUEST FOR PEACE AND STABILITY IN THE INDO-PACIFIC REGION. JATI - JOURNAL OF SOUTHEAST ASIAN STUDIES, [S.l. ], v. 22, n. 1, p. 26-47, dec. 2017. ISSN 2600-8653. Available at: <https://jati.um.edu.my/article/view/10244>. Date accessed: 26 apr. 2019. doi: https://doi.org/10.22452/jati.vol22no1.3.